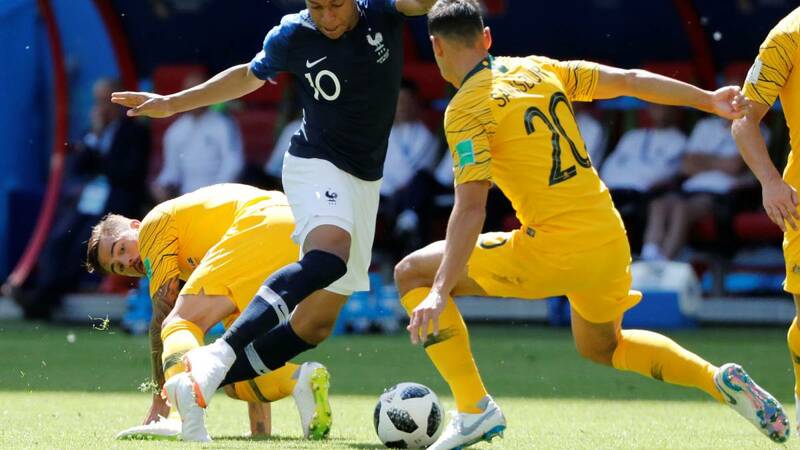 The first half of the France - Australia match in World Cup 18 Group C saw the Telstar 18 ball burst under pressure. The Adidas Telstar 18, the official ball of the World Cup in Russia, started suffering technical malfunctions during the France - Australia match in Kazan, with the ball bursting during the first half. The players were forced to stop play in the 29th minute, when Griezmann played the ball to Lucas, who was tackled by Sainsbury, with the ball apparently bursting under the pressure. The now flat Telstar was kicked into touch, and Griezmann restarted play with a new Telstar 18 which he sportingly threw to to Australia keeper Ryan. Somehow I feel like it's the most Australian thing ever for a defender to tackle so hard that he burst the ball. In the 34th minute, as Dembélé went to take a corner he was given a ball, which he tested and discovered was burst. He chucked that one away and got a new one. (There is a possibility it was the the ball that burst in the 29th minute that had somehow come back into circulation). In the now standard ritual when a new ball is released, the goalkeepers had a good old moan about the ball for the World Cup in Russia as soon as they got their hands on it. "It's really strange" said De Gea at the time. Which was probably what Spain fans thought of his attempt to save Ronaldo's shot during the Portugal - Spain Group B match on Friday night, as the ball slipped through the Man Utd keeper's fingers and into the net to give Portugal a 2-1 lead at the time. The Telstar 18: "One of the most iconic balls of all time"
"The original Telstar is one of the most iconic footballs of all time and one which changed football design forever," Adidas' Roland Rommler declared at its official unveiling late last year. "So developing the Telstar 18 while staying true to the original model was a really exciting challenge for us. "The new panel structure and inclusion of an NFC chip has taken football innovation and design to a new level and offers both consumers and players a completely new experience." But having far from earned universal approval for the balls that they have designed for recent World Cups - particularly 2010's infamous Jabulani - it appears that Adidas' 2018 effort is also in line for its fair share of controversy, and with today's bursting that's only adding to it.